The next game from creators of Crypt of the NecroDancer, Brace Yourself Games is coming exclusively to Nintendo Switch this Spring! The snappily named Cadence of Hyrule – Crypt of the NecroDancer Featuring Legend of Zelda was a surprise announcement tucked in at the end of today’s Nindies showcase. Cadence of Hyrule looks to offer more of the same winning formula that Crypt of the NecroDancer became known for. The roguelike rhythm game takes players through dungeons, fighting off enemies and navigating through to the beat of the music. Fight familiar enemies and collect Rupees. This time around you have Link and Zelda from Nintendo’s beloved franchise to help. As the title alludes to, the game is set in the mythical kingdom of Hyrule and the music you’re keeping in time to will sound very familiar to Zelda fans. Other tidbits from The Legend of Zelda series were also shown in the announcement trailer. For example, enemies include Bokoblins and Rupees could be seen scattered throughout the world. 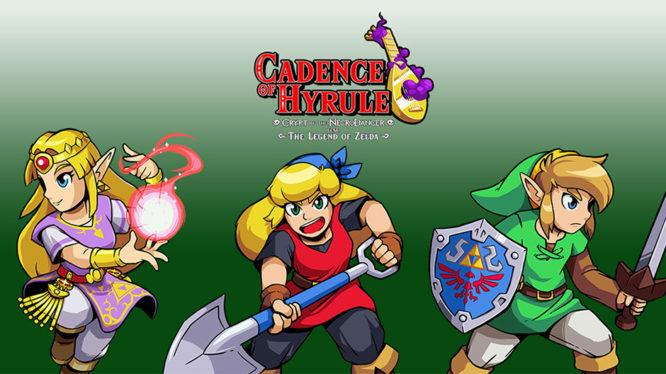 More information is no doubt on its way but the eShop listing for Cadence of Hyrule suggests that the game will support two players. No firm release date for the game has been announced yet but Cadence of Hyrule – Crypt of the NecroDancer Featuring Legend of Zelda is expected to release on Nintendo Switch later this Spring.